Some of us, now at 'a certain age' may remember reading the exploits of a precocious English schoolboy called William Brown. When asked what he wanted to be when he grew up William replied “Well, electricity, the telephone and bulls-eyes have all been invented. 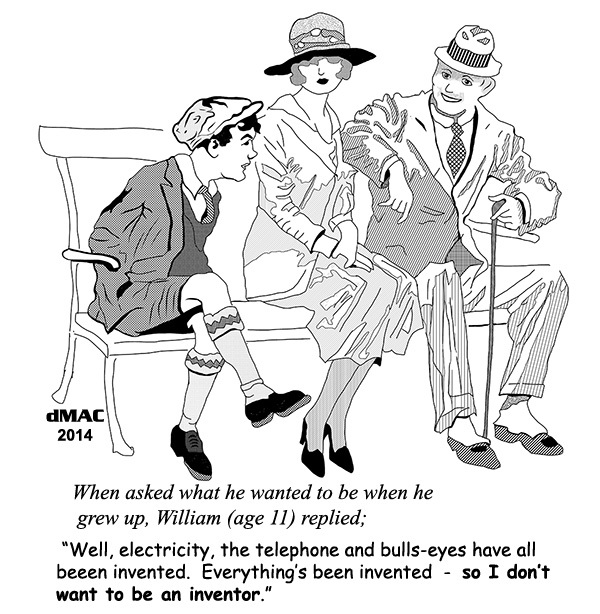 Everything’s been invented – so I don’t want to be an inventor.” Was William right? Woman Libbers’ Rejoice One unusual anomaly is a man will generally live longer if he is married, while a woman will live longer if she is not married. Advances in medical science in the past 100 years, some of which are listed below, have extended our life expectancy. Health is partly determined by your genes as well as being linked to your environment and lifestyle. 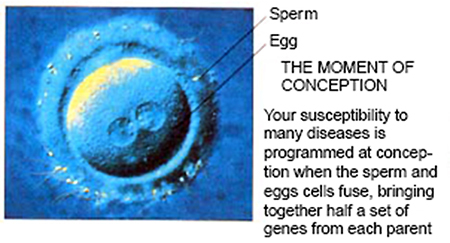 A person’s genetic inheritance may result in a disease or disorder developing later in life such as diabetes mellitus. Life expectancy has risen dramatically in the past 100 years due to improvements in nutrition, sanitation and health care. A better understanding of the mechanism of disease resulted in the discovery that lifestyle factors such as smoking and a high-fat diet contribute to major illnesses. This has led to an emphasis on healthy living to reduce the chance of disease, safety legislation and immunisation to protect the population. However as people now live longer, the major causes of ill health and death have changed. In the developed world infectious disease and under nourishment have been superseded by heart disease, cancer, stroke and smoking-related lung disease. A high fat diet and sedentary lifestyle contribute to many of these disorders. Poor vision, deafness, arthritis and loss of memory tend to develop with increasing age. Although people enjoy more years of good health than before, elderly people can still expect a period of on average 10 years of mental and physical illness. Our vote for the greatest medical milestone goes to the discovery of penicillin. This became the building block for developing many other antibiotics used today. Upon his return, Fleming discovered that in the areas surrounding the mould growth, the bacteria had all been killed. He correctly concluded the mould had produced an anti-bacterial substance. It was 13 years before Fleming’s discovery made an impact. The first attempts to apply his “miracle drug” again highlight the role of chance. Scientists Howard Florey and Ernst Chain developed methods to purify the anti-bacterial substance accidentally discovered by Fleming. They then had to test the drug. Standard procedure would have been to deliberately infect guinea pigs with a virulent bacterium and administer the drug to see if it had any effect. Once again luck stepped in. The researchers decided to use mice as well as guinea pigs. We now know that penicillin is fatal to guinea pigs even in minute doses and such experiments would have been a dismal failure, in all likelihood curtailing further development of the drug. Florey himself admitted “Mice were tried in the initial toxicity tests. What a lucky chance that was. 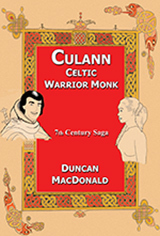 If we had used guinea pigs exclusively, we would have said that penicillin was toxic, and we probably should not have proceeded to try to overcome the difficulties.” It is only by luck that that mice and humans happen to respond similarly to this drug. 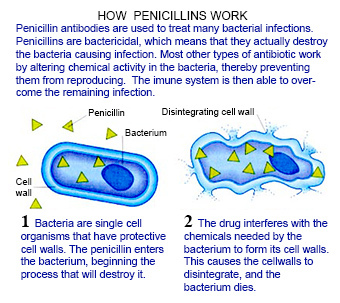 Penicillin kills bacteria by preventing the formation of cell walls that bacteria need to survive. Initial methods of producing penicillin involved the use of tins, trays and bottles proved inadequate. After many tests, Florey’s team discovered that ordinary bed pans, borrowed from Radcliff Infirmary, were the most efficient containers for growing penicillin. The first man was treated with penicillin in 1941. He was treated for blood poisoning. Widespread use of penicillin to treat infected wounds during World War II meant by mid 1940’s penicillin became widely available for use as medicine. Hard driving Aussie scientist Howard Florey failed to interest British pharmaceutical companies in producing penicillin. He then flew to USA and with the help of Pearl Harbor, was able to convince the American government to 'encourage’ pharmaceutical companies to speed up the production of penicillin to treat war wounds. It now plays a major role in treating illnesses such as pneumonia, rheumatic fever and scarlet fever. While penicillin had been discovered pre-war by Sir Alexander Fleming, it took the war to force companies to develop a way of making the highly effective medicine on an industrial scale. Credit for this goes to Howard Florey and Ernst Chain and many soldiers wounded in combat had both men and their team to thank. For this research and achievement, Florey, Chain, and Fleming shared the Nobel Prize for Physiology or Medicine in 1945. By the end of the war, such was the research into penicillin that several strains were developed. Also the 1945 version of penicillin was some 20 times more potent than the 1939 version. The mass production of penicillin was always of great importance to the Allies yet it was also a difficult thing to achieve. Penicillin was used en masse after D-Day on wounded men and it was found to be especially effective against gangrene. 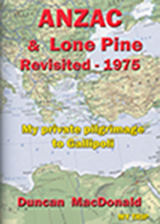 Despite the changes in warfare, one problem that barely changed was the time lapse between when a man was wounded and when he could be operated on by a surgeon. In the British Army, the average time lapse was acknowledged to be 14 hours. Prior to the use of penicillin, such a period of time allowed a wound to fester. With the use of a penicillin dressing, the chance of a wound getting infected was vastly reduced and survival chances greatly increased. 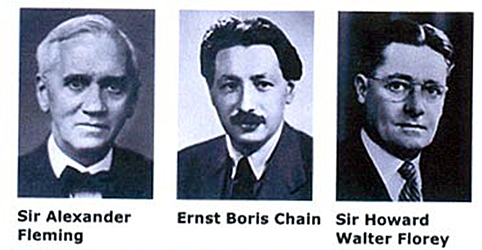 Sir Alexander Fleming (Scot), Ernst Boris Chain (German) and Sir Howard Walter Florey (Australian) were jointly awarded the 1945 Nobel Prize in Physiology or Medicine. The medical milestones of the 20th century will certainly be eclipsed by ones yet to be made in the 21st century. Scientific medical milestones will continue to contribute in extending both our age and quality of life. However, we conclude that the discovery of Penicillin was the Most Important Medical Milestone of the 20th century. Richmal Crompton Lamburn (15 Nov 1890 ~ 11 Jan 1969) was initially trained as a schoolmistress but later became a popular English writer, best known for her Just William series of books, humorous short stories, and to a lesser extent adult fiction books. Richmal Crompton Lamburn was born in Bury, Lancashire, the second child of the Rev. Edward John Sewell Lamburn, a Classics master at Bury Grammar School and his wife Clara (née Crompton). Richmal Crompton attended St Elphin's boarding school for the daughters of the clergy, originally based in Warrington, Lancashire. She later moved with the school to a new location in Darley Dale, near Matlock, Derbyshire in 1904. In order to further her chosen career as a schoolteacher, she won a scholarship to Royal, part of the University of London in Green, Surrey. Crompton graduated in 1914 with a BA honors degree in Classics (II class). She took part in the Women's Suffrage movement. In 1914, she returned to St Elphin’s as a Classics mistress and later, at age 27, moved to Bromley High School in southeast London where she began her writing in earnest. She was an excellent and committed teacher at both schools. Having contracted poliomyelitis, she was left without the use of her right leg in 1923. She gave up her teaching career and began to write full-time. Later in her forties, she suffered from breast cancer and had a mastectomy. She never married and had no children although she was aunt and great-aunt to other members of her family. Her William stories and her other literature were extremely successful and, three years after she retired from teaching, Crompton was able to afford to have a house (The Glebe) built in Bromley Common for herself and her mother, Clara. According to the actor John Teed, whose family lived next door to Crompton, the model for William was Crompton's nephew Tommy. In spite of her disabilities, during the Second World War she volunteered for the Fire Service. She died in 1969 at her home in Chislehurst, London Borough of Bromley. In 1922, the first collection, entitled Just William, was published. She wrote 38 other William books throughout her life. The last, William the Lawless, was published posthumously in 1970.